A horizontal divider is just a horizontal line that can be used as a divider. You could alternatively add a border via CSS in certain cases. You can add a Horizontal Divider under “UberMenu Advanced Items” in the left column of the Appearance > Menus screen. 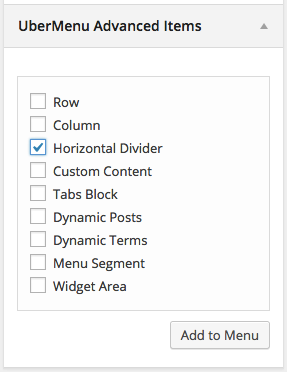 Note that there are no specific settings for a Horizontal Divider item.